The Thoroughbred industry caught a slight breather April 6 as the actual subject of racing and the Triple Crown series took the main stage. Splendid racing returned to Central Kentucky as Keeneland hosted a gaggle of graded stakes with its Central Bank Ashland Stakes (G1) and Toyota Blue Grass Stakes (G2) as its centerpieces, and Aqueduct delivered the goods with its Wood Memorial Stakes Presented by NYRA Bets (G2) program. Still, events in Southern California were on everybody’s mind. 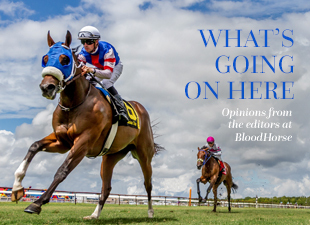 Nary a conversation started in the Keeneland paddock where the topic didn’t quickly veer to, What’s going on in California; what do you think about California; or what’s going to happen in California? The Stronach Group’s Santa Anita Park was able to conduct the meet’s biggest card, featuring the Santa Anita Oaks, Derby, and Handicap Presented by San Manuel Indian Bingo and Casino (all G1) without incident, but field size was an issue. The grand Bellafina defeated just three in the Oaks; the Bob Baffert-trained Roadster edged the Baffert-trained Game Winner in the six-horse Derby, with the same number contesting the Big ’Cap that had been delayed from its original date of March 9. The game is on tenterhooks, not just in Southern California, but across the country. Despite announced efforts by TSG and the California Horse Racing Board to make racing safer at Santa Anita, they continue to face the fact 23 horses have died there since Dec. 26. The fatalities have come in both races and training, and on the dirt and turf courses. New medication policies are in place and new rules regarding use of the whip await a 45-day comment period. Plans for the April 12 program to be contested without riding crops might be a good idea on paper, but wouldn’t those races be best served as betless exhibitions? Also, who is to know what will surface at the CHRB meeting the same day? California Sen. Dianne Feinstein has weighed in, calling on the CHRB to suspend all racing at the track. The situation at best is both vague and fluid. In any business it is wise to hedge one’s bets. It seems some California-based trainers are doing just that. Peter Miller sent out Spiced Perfection to win the seven-furlong Madison Stakes (G1) April 6 at Keeneland. While it’s not that newsworthy for a California-based trainer to ship a horse to Kentucky for a grade 1 event, it is what he said after the race that held some weight. Miller, who has 75 horses in training in Southern California, noted he’d like to have anywhere from 20-30 at Churchill Downs or Keeneland. “We haven’t worked out the particulars about the number of stalls, or whether we’re going to be here and ship over to Churchill,” he said. Ben Huffman, racing secretary for both Keeneland and Churchill Downs, said he’s received many calls from many trainers in the Southern California area requesting information regarding stabling this spring and summer. However, stall applications were due some time ago. Increased purses for the Churchill meet with the added revenue from the instant racing at Derby City has made the spring/summer meet under the Twin Spires more attractive, but Huffman said that was noticed by East Coast horsemen during the Breeders’ Cup last fall. “Only one (Southern California) trainer applied at the time (applications were due),” Huffman said. “The trainers that are calling now are doing so with trepidation in their voices. They don’t know what to do. Their lives, their families are in Southern California. They don’t want to leave, but they don’t know what’s to come. We’re not sure, either, but let’s remember: We’re all in this together.